The Jeep Grand Cherokee, like all Jeeps, has always been a little rough around the edges. Call it charm; call it character; call it lack of development funding. So I was more than a little surprised by the redesigned 2011 Jeep Grand Cherokee, a sport utility vehicle so good I preferred it over a luxury SUV that I drove the next week - and that cost $20,000 more. That's amazing, considering its gestation occurred under the auspices of three different owners: first Daimler, then Cerberus Capital Management and now Fiat. And it's arrived unscathed, still delivering a blend of the civilized and uncivilized. Somehow, though, it's more refined than ever, offering luxury gear and capability that's unmatched at this price. The new platform, shared with the Mercedes-Benz M-Class, is 146 percent stiffer than the 2010 model. Its suspension is fully independent, while a new optional air suspension lifts the Jeep an additional 4.1 inches, for 10.7 inches of ground clearance. Off-road agility? You bet. There are three four-wheel-drive systems and two "Off-Road Adventure" option packages, depending on how far off-road you want to venture. But that's expected in a Jeep. The big news starts with its interior. If you want your Jeep decorated in the shiny hard plastic of yore, forget it. Surfaces are soft to the touch. Other items, such as the lined glove box, are dampened so that they don't flop open. The ***** don't feel cheesy or cheap. The steering wheel is thick and comfortable to grip. The seats are comfortable for long stints in the saddle. Front-seat room is plentiful, and rear-seat legroom is up substantially from last year. There is no third row. Opt for the top-of-the-line Overland model, and you'll be astounded: Soft glove leather covers the doors, steering wheel, center console and instrument panel. Wood accents warm the interior. And it's crammed with gear: panoramic sunroof, heated and cooled front seats, rear-view back-up camera, nine-speaker audio system with 506-watt woofer and sub-woofer, push-button starter, power lift gate, automatic headlamps and 20-inch wheels. Another thoughtful touch: Its spare tire is inside the vehicle. Options included blind-spot monitor, rear cross-path detection (for items about to cross your path), adaptive cruise control (which maintains a set distance from other cars at a set speed), and a collision warning system (which alerts you to take action to avert a crash). All of the luxury gear has been shoveled into Jeep's stiff new body, with its new suspension and a new engine: Chrysler's 290-horsepower "Pentastar" V6. This double-overhead-cam, flex-fuel engine, debuting in the Grand Cherokee, delivers 38 percent more power than last year's V6 but 11 percent better fuel economy. More important for four-wheelers, it delivers 260 foot-pounds of torque. Most folks will find this engine plenty powerful for merging on highways, passing situations and boulder-bashing. It's quiet, and better yet, it's a perfect balance of power and fuel economy, returning 19 mpg in mixed driving. If you must have 8 cylinders, a 360-horsepower 5.7-liter V8 is available. The Grand Cherokee's ride is a deft balance. Thoughtfully, Jeep's designers have lengthened the wheelbase, which has enhanced ride quality. Engineers banished the old model's bouncy ride, but there's enough suppleness for off-road situations. Agility is enhanced by a terrain response system similar to the one used by Land Rover. Called "Selec-Terrain," it has five modes: auto, sand/mud, sport, snow and rock. It's safe, too: It's been designated a "Top Safety Pick" by the Insurance Institute for Highway Safety. 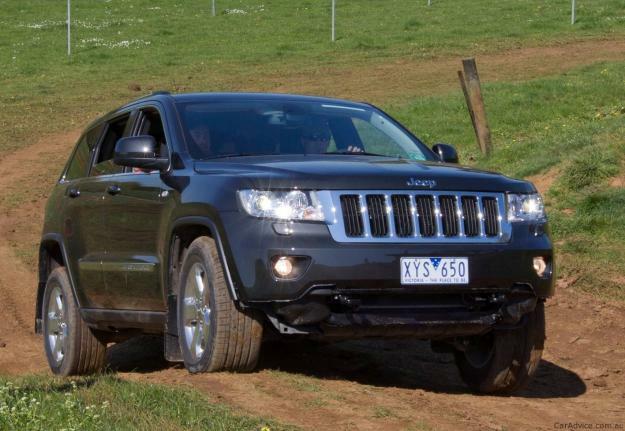 It seems that, corporate distractions aside, the 2011 Jeep Grand Cherokee has emerged as an SUV that once again merits consideration regardless of your price point. And while the base model is affordable, it's the Overland that's the real bargain here: It easily outclasses pricier SUVs with much tonier names.